With Sonia Bullot officially becoming a member of the Kokomo crew in 2000, the band decided to mark Kokomo's 10th anniversary in 2001 by releasing a limited edition - 500 copies, individually signed and numbered - CD, Blues And Beyond, featuring four new recordings and a selection of unreleased stuff and remixes from the vaults. The touring continued over the next few years, with the band again convening to Nigel's Boatshed Studio to record the all-original Songs Of Love and Not. It was released in 2003. Nigel Masters and Derek Jacombs also formed a side project called The Self-Righteous Brothers and in 2004 recorded their debut album RustySwingFeel. It was released the following year, and in 2006 there was a live CD Kokomo à Gogo, recorded at Tauranga Baycourt Theatre which unveiled Kokomo's current incarnation as a six-piece with the addition of drummer Ian “Beano” Gilpin and guitarist Mike Kirk. 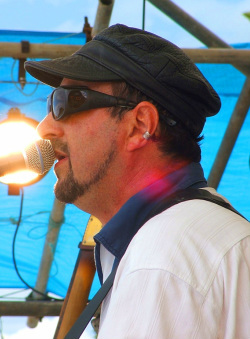 2007 saw the release of the accompanying Kokomo à Gogo DVD, a full-length concert film, and later in the year harmonica player Grant Bullot featured on the Harmonica Masters of New Zealand CD. 2008 marked a departure for Kokomo when the band released In The Well. A long-planned labour of love, it is a collection of the songs of Bob Dylan, rearranged and reinvented with inimitable Kokomo style. The album was launched at a headline concert along with Billy TK Jr at the National Blues Festival in Rotorua. During 2010 the band performed at the National Jazz Festival where trumpeter Sonia Bullot released her first solo trumpet album, Tonight On Trumpet, featuring a host of top New Zealand musicians including Julia Deans (Fur Patrol), Wellington swing kings Shaken Not Stirred, and Sydney-based jazz piano virtuoso Gerard Masters. In late 2011 Kokomo went back to its roots, recording a new album – It All Comes Round - and returning to the original Kokomo Blues line-up of the early nineties: an acoustic trio exploring early Delta blues and ragtime, with a scattering of contemporary Kiwi blues and oddities from through the years. A year of touring and festival appearances followed, during which time The Self-Righteous Brothers released a second album Social Fretwork (2012). Throughout 2015 Kokomo released a series of singles and videos - "World's Most jealous Girl", "Plastic Jesus (2015)", "We're All Strangers Here" and a reworking of their tribute to the city of New Orleans' on the 10th anniversary of Hurricane Katrina, "Home of The Blues". Videos for these can be found on the "Listen & Watch" page. In 2016 Kokomo released a 2-CD boxed set, Batten Down the Hatches, to celebrate 25 years of making music, and launched it at a sold-out 500-person concert at Tauranga's Baycourt Theatre which was filmed and recorded. Special guests included Nigel Gavin, Grant Winterburn, Tracie de Jong, Robbie Laven, Marion Arts, Damian Forlong and more. Along the way Radio New Zealand has recorded five programmes focusing on Kokomo’s music, and they have appeared from time to time on TVNZ and TV3. Kokomo’s music has also been used as the soundtrack for projects as diverse as TV gardening shows and surfing videos. It has also featured on such popular programmes as Shortland Street and Jackson’s Wharf. The band have also made various music videos, one of which won awards and one of which is in the permanent collection of the NZ Film archives. They have also played with and supported a number of overseas blues and jazz acts, including Georgie Fame, Richard O'Brien, Doug McLeod, Keb Mo, Buddy Guy, "Mississippi" Willie Foster, The LeRoi Brothers, Hans Theesink, New Orleans singer Lillian Boutte, Hawaiian steel wizard Ken Emerson, and legendary guitarist Amos Garrett (ex-Butterfield Blues Band). On the local front they have performed and toured with the likes of Roy Phillips (ex-Peddlers), Hammond Gamble, Dragon, Jan Preston, Midge Marsden, Shona Laing, Barry Saunders, Mike Cooper and many others.